Wow! - Want to board a beautiful sailboat and tour the waters of Door County, taking in some of the 250 miles of shoreline beauty Door County has to offer? Well, hop aboard Sail Door County and take an early morning cruise, an afternoon cruise or a glorious sunset sail! And new in 2018, they now offer parasailing! What fun! Sailing out of the Sister Bay Marina, Peder Nelson is Captain and owner of two spectacular sloops, a Cal 40 (named, Passage North). The Cal 40, first introduced in 1963 by the Jensen Marine Corporation, was inducted into the American Sailboat Hall of Fame in 1996. This is a spectacular boat! 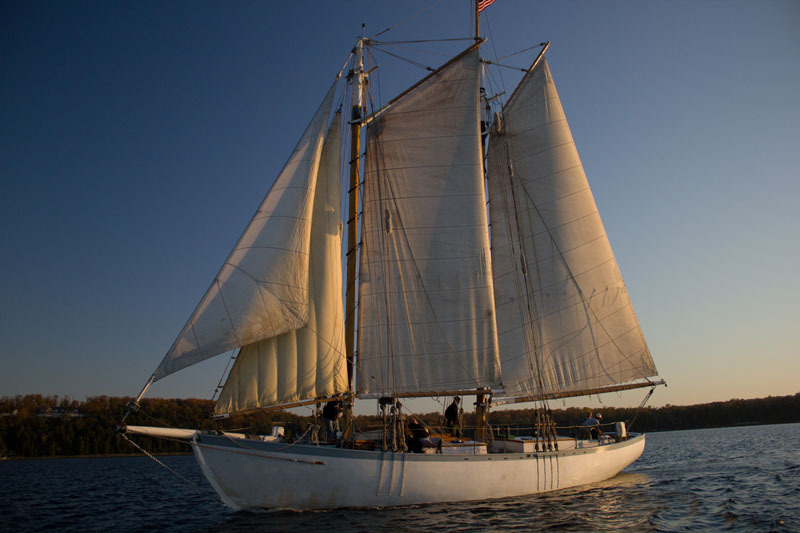 And in 2012, Captain Peder has added the Edith M. Becker - a fabulous, traditionally rigged schooner) a "tall ship") that is about 55 feet in length, and which (under previous ownership) has sailed around the world twice! See photo to the right! We met with Peder Nelson, the owner of the boats and the Captain. The boats can take out about 6 passengers at a time – so your group can sail the sparkling waters around Door County. And you are encouraged to bring music, food and the beverages of your choice aboard the boat! We took a sunset sail with the Captain aboard the C&C 38 and enjoyed ourselves immensely, and have sailed numerous times with Sail Door County. The other passengers aboard also had a wonderful time as we sailed out of Sister Bay and around Horseshoe Island, and down around Ephraim and back - spectacular! And the Captain, who grew up in Door County and whose family has been in the commercial fishing business since the later 1800's, knows these waters. He truly is the son of a son of a sailor man and is an extremely knowledgeable Captain. We also talked to some folks who have been aboard Sail Door County, and they have all said what a wonderful time they had aboard. Sailing two great boats out of Sister Bay, you cannot afford to pass up this wonderful opportunity to sail the waters of Door County. Head to the Sister Bay Marina, and get ready for a wonderful day on the water. Sailing about 3 times a day (morning, afternoon and sunset), you will want to make this part of your next trip for sure! And you will want to return too! In Sister Bay, you will find them in the marina right across from the Inn at Kristofer’s restaurant. Look for the “Boat Rides” sign. The charter fees are very reasonable, so call Sail Door County for an accurate and current quote. You can charter out the whole boat with a few friends and have a grand time in Door County. Whether you’re looking for a way to have some fun on the water, or looking for a way to add a touch of romance to your getaway in Door County, Sail Door County is your answer. And they even offer Gift Certificates - how perfect is that? You could book ahead of time, since there is no charge for cancellations with 24 hour notice, and never a charge for cancellations due to severe weather advisories. DoorCountyNavigator.com's advice? Book ahead of time - that way you know for sure you have a spot aboard the boat – highly recommended. You can also make last minute reservations, of course, depending upon availability. Visit their website for more detailed information on times and seasonal sailing (May - October)! We have sailed many times aboard Sail Door County, and there is just no better way to see Door County than from the water aboard one of these fabulous boats. Door County is unique in all it offers – and its wonderful waters and 250 miles of coastline, islands and sunsets make it a very special place – take advantage aboard one of these fabulous sailboats at Sail Door County! Please tell the Captain that you found him on DoorCountyNavigator.com - that helps keep this site alive & well . . . for you! Happy sailing!